2378-2381: USS Avalon – ACSO – Lieutenant J.G. 2381-2382: USS Falcon – CSO - Lieutenant J.G. 2383-2383: Starbase 17 – Science Officer – Lieutenant J.G. 2384-Pres: U.S.S. Washington – CSO - Lieutenant J.G. "Those who were dancing were thought to be insane by those who could not hear the music." Ashelin possesses an array of tattoos. The first being an Ankh, the Kemetic (Egyptian) symbol for life and creation. This Ankh rests along her inner right calf. She has an elaborate panther etched into her outer right thigh, representing perseverance. Lastly, Ashelin has a self-created motto: "To comprehend and apply" engraved into her upper back. Ashelin has been known to be quite the people person. She has no problem interacting or working with personnel during an assignment. Her scientific perspective mixed with her ability to translate said findings into something that others can understand has proved to be useful in the past. Her outlook on life is propelled by fascination with the unknown. This includes applying what she knows to assist in the unification of all peoples everywhere. A hefty bill, but it's a goal. Off duty, Ashelin is still quite friendly though she has a way of retreating into her own little world to be with her thoughts. She possesses a large amount of patience and persistence. However, if she's pulled in a direction conflicting with her ideas, Ashelin has something of a problem saying 'no.' This has resulted in poor decision making in some instances that clearly could have been avoided. She attempts to find the good in all people. Once comfortable with a person, Ashelin will become quite loyal. Psychological Record: "Cadet Sarrett possesses a phobia of multi-legged insects that reduces her to an unbalanced mental state. This trauma can possibly be overcome with time and confrontation." "Lieutenant Sarrett claims to have been doing the right thing in the situation involving her disobeying a direct order. She says that she'd do it again, given the chance and next time would try not to get anyone killed. I wouldn't call her instable, but I have recommended some time off duty. Her removal from the Zodiac was for the best. Lieutenant Sarrett's loyalty to a Commanding Officer is unquestionably sound. Her problem involves making the right decisions to define that loyalty." Has to sleep on the side of the ship in which the stars are leaving her, if a viewport is present; Always has a Kenyan Black Tea in the morning and at night; Sometimes wears the skirt variant of the duty uniform. The scientific; Developed a liking for volleyball on the beach instead of in a gym; She takes it upon herself to make sure that she does that good deed for someone, which normally makes her feel good; Observing ecosystems and the bustle of lifeforms; She has a soft spot for honey roasted peanuts which has been used as leverage against her in the past. Starship combat or confrontations involving phasers or other kinds of beam weaponry though she has gotten better with it; Most of the superficial minded persons in the galaxy; Starbases; Cold climates. Strengths/Weaknesses Study and examination of unknown habits and environments; analysis, comprehension and translation of scientific data and situations; keen departmental leadership skills; Possesses a feel for people. Phobia of many-legged insects due to a childhood prank that has deeply traumatized her, specifically centipedes; Has been known to be an escapist at times, daydreaming in her own thoughts and creating imaginary worlds for her mind's enjoyment; Has a difficult time with linguistics; Sometimes reacts to a situation without thinking it through for the best solution. Ambitions/Hobbies: To persevere in her assignment; To encounter new life and make first contact; To forever learn and teach. Has been performing African and Caribbean Dance since her second year of high school, she also tries to kept up with her father's teaching of Capoeira; She came to like gardening for its scientific and spiritual purposes; Enjoys creative writing which mostly covers short stories and poetry. In the temperate climate of Virginia Beach, Virginia, Efren and Sybil Sarrett brought Ashelin into the world. Being born in a city off the coast presented Ashelin with a place to journey to everyday; a place full of new things to discover and experience. This place was the beach and she never could get enough of it. Those who knew her claimed that she practically lived on the long stretches of sand, collecting sea shells and fostering ocean life for a night or two. Her enjoyment of ocean habitats stuck with her as she aged and entered high school and Ashelin attempted to study as much as she could about the marine ecosystem through observation and experiments of her own. She took trips to several spots on Earth to further explore marine study including Seattle, Washington North America and Mizaki, Japan. Volleyball on the beach and African dancing were some of the activities Ashelin participated in during high school. Her father showed her a bit of capoeira every now and again as it would meld into her dance movements gracefully. As a teenager, her mother would make her tend to garden work and Ashelin eventually learned to like it as she considered a gardener's patch to be another ecosystem with unworldly qualities. Ashelin soon realized that she enjoyed observing the tendencies and lifestyles of environments and their inhabitants; these being whatever lifeforms are in attendance. With Earth considered to be the relative standard of science, Ashelin set her eyes on the sea beyond the beach: the sea of stars. Graduating fourth in her class from First Colonial High, Ashelin prepared to take the entrance exam to Starfleet Academy. Ashelin's first year in the Academy proved to be one of so many possibilities. She did very well with general studies, learning as much as she could before her concentration narrowed down to science. Ashelin decided to continue playing volleyball in the Academy and always had a hard time getting used to being without a sand filled court. Anthropology and chemistry were among some of her introductory courses. During the second year, she began her introduction to post secondary school sciences and found the whole thing a bit overwhelming. Ashelin's grades began to decline and she dug herself into a rut, questioning her reason for trying to make it in Starfleet. This was until she crossed paths with a Betazoid female named Yalino Regur; a linguistics major with a fiery spirit. Yalino helped the Virginia Beach native out of her slump and they became best friends in the process. With a renewed confidence, Ashelin set out to do her best in her third year of study at the Academy. She started her focus in exobiology and never looked back. It was a heavy load but Ashelin did possess a liking for the topic and was soon close to returning to doing her best work. Ashelin found an interest in creative writing after taking it as an elective. When the Breen Confederacy attacked Starfleet Headquarters and San Francisco in late 2375, Ashelin was among a number who were injured in the assault. She fell victim to a shoulder wound and minor cuts. During the bit of chaos, Ashelin did what she could to aide her fellow cadets who were worse off than herself. The experience made her take a step back and look at life. Her conscious was relieved when the Academy ordered that all cadets enroll in a more thorough tactical course, even though she learned to dislike it. In Ashelin's final year at the Academy, she became more comfortable with her decision to the sciences. Yalino and Ashelin entered the Academy marathon, and even though neither one of them finished anywhere near a braggable ranking, they did have a good time. Ashelin graduated Starfleet Academy in 2377 with a major in exobiology and a minor in physics. Her first post was the U.S.S. Avalon, a Nebula-Class vessel and Ashelin was excited to finally allow her senses a chance to touch all that space had to offer. She was given the position of exobiology specialist on the Avalon and served well for a little over a year until she was promoted to Lieutenant Junior Grade. With this promotion came the reassignment to assistant Chief of the science department. She earned these upgrades through exceptional research in her field. Ashelin learned under the Chief Science Officer of the Avalon and brushed up on the other angles of science. She had gotten so lost in her specialty that she nearly forgot how vast science really was. Acting as the chief's right hand woman for the duration of her time on the Avalon proved to be quite an experience. The ship had most of the resources a science officer would want, scientific bliss almost. Nearly three years with the Avalon brought Ashelin news of a Chief Science position on the U.S.S. Falcon. It seemed like a downgrading from her current position since the ship was a Federation Corvette designed for combat, with possibly small room for exploration. After a bit of deliberating, Ashelin decided to accept the position on the Defiant-Class vessel and view the universe from a different part of the sea. And it turned out to be the most different part of the sea she could have ended up in. Her first mission with the Falcon involved the abduction of the commanding officer - Captain T'Rhiu Vernek Andarai - and the swapping of bodies with a young Cardassian male via the use of a special 'white' crystal. Sarrett had succeeded in tracking down the enemy vessel that had abducted Captain Andarai by collecting the lingering transporter beam elements and retracing their trajectory. Working alongside Lieutenant Junior Grade T'Prem, they were able to discover the abilities of the crystal and harnessed such knowledge to return Captain Andarai to her original body. After a brief shoreleave stint at the Falcon's port, the marvelous Nivoch II, Lieutenant Junior Grade Sarrett was sent out on her second mission with the Falcon. Giving chase to a Starfleet vessel, the Prometheus-Class U.S.S. Theano, under the control of a newly crafted rogue artificial intelligence, Ashelin was given orders to slingshot the Falcon around a massive gas giant. Collaborating with the chief CONN officer, Lieutenant Junior Grade Jonathan de Falco, they were able to plot a safe trajectory around the gas giant while the Falcon's crew, in essence, slept through it. Once they reached the destination of Draikar VI, the confrontation with the Theano commenced. Lieutenant Junior Grade Sarrett was part of the away that went to the planet surface to search for the possibility of the Cardassian Genii Activist Group being involved. Trudging through the freezing terrain and surviving an avalanche, the away team found the Genii along with a group of unknown creatures and the power source of the Theano A.I. A confrontation broke out and Ashelin suffered a few injuries but managed to gather biological and physical data on their otherworldly aggressors. She also managed to save the life of a Bolian medical corpsman, Crewman Vint. For her efforts involved in the mission, Ashelin was commended with the Honour of Excellence. The third mission arrived in no time and Ashelin shipped out once again. This time she was primed with the task of navigating through a dense collection of gravitational eddies surrounding Ntigano III, a planet with a dying sun. Because this was a backup plan, it was put on the backburner. Ashelin was ready to use it in a moment's notice, after consulting with Warrant Officer Kay'embar Terrace and Chief Warrant Officer Oliver Hynd, Chief of Engineering and Operations respectively. However the Falcon took a more diplomatic route to solve the problem of getting to Ntigano III. An away team had to take part in a hunt by a species with the known charts to make it into the Ntigano system alive. Ashelin was involved in the hunting away team and injured herself using a tricorder in a 'no use' zone. She was able to catalog a number of biological agents while inside the Legacy Preserve - the location of the hunt - and went toe to toe with a few of its vicious inhabitants. When the team realized that they were given faulty equipment and weapons to protect themselves from harm, Ashelin was able to uncover the fake "tranquilizer" to be a combination of sugar substances. This evidence was used to bring their saboteurs to justice. The charts were gained as the hunt was successful and the evacuation of Ntigano III commenced. Upon returning to Nivoch II, Ashelin was promoted to full Lieutenant and was offered the position of second officer, which she accepted readily. Her fourth mission began when the Falcon was out on a routine patrol at the boarder of their assigned sector. The Falcon encountered a canine-like species that called themselves the Varg. Since the alien' intentions seemed noble, Ashelin beamed over as part of the greeting party to dine with the Varg. Ashelin and the away team returned to the Falcon after a tour of the Vargan vessel and a very fascinating dinner arrangement. All appeared to be well… that is until the Varg came about and opened fire on the Falcon. Ashelin and the crew discovered that the Falcon had been sabotaged by their guests and an abandon ship order was given. Ashelin and the Falcon crew were forced from the vessel and taken prisoner by the Varg. The Falcon crew was taken to the Varg planet where they were set free and then hunted by the Varg for sport. Ashelin assisted the Command team in plotting the revolt against the Varg and was partially responsible for getting a signal out to the Federation. After a hard fought battle, Federation forces beamed down to the planet and rescued the Falcon's crew. Ashelin, along with the others, were now without a ship. 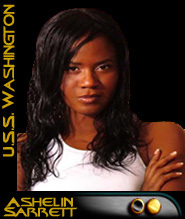 Ashelin was assigned to the Steamrunner-Class Zodiac as science chief and second officer under Captain Robert de la Haye once more. Most of the Falcon's crew was transferred to the Zodiac, which made the transition a bit easier. However, before their first mission could begin, Captain de la Haye was pulled away from Command for reasons unknown to Ashelin. She had a feeling that it had something to do with the loss of the Falcon. And a few days later, Commander Byel - Executive Officer of the Falcon - was deemed unfit for duty and admitted to Starfleet Medical for observation and treatment due to injuries and probing performed on him by the Varg. This left Ashelin as the temporary Commanding Officer of the Zodiac. She was given direct orders from Starfleet Command to perform the shakedown cruise for the vessel while on the way to pick up the new CO and XO. While en route Ashelin, and several former Falcon crewmembers, intercepted a Vargan transmission that contained information on the assassination plot against Captain de la Haye. Ashelin reported the findings to Starfleet Command but was unable to get approval on pursuing the mission. Though Ashelin and a handful of Falcon crewmembers were the only ones who knew anything about the Varg, they were not permitted to take part in the mission due to their "inexperience" and unnecessary need of the Zodiac to rescue De la Haye. Ashelin, unconvinced, disobeyed the order and redirected the Zodiac to assist in the mission to save Captain de la Haye. De la Haye was rescued before the Varg could get to him. Unfortunately, Command ended up being right and the Zodiac was not required during the operation. To make matters worse, the Zodiac had lost several crewmembers during the shuffle, not to mention considerable damage to the recently christened vessel. Returning the vessel to the new CO and XO, Ashelin took full responsibility for her actions and the actions of the crew. While Ashelin and the crew were commended on intercepting the Vargan message, she was charged with insubordination, and minor theft of Federation property. Ashelin was reduced in rank to Lieutenant Junior Grade, stripped of her duties aboard the Zodiac and removed from the 6th Fleet all together. She was reassigned to Starbase 17 and received frequent visits from Starfleet Intelligence for information on the Varg. Six months into her stint as a science officer on Starbase 17, Ashelin heard about an opening in the science chief position aboard the Defiant-Class U.S.S. Washington in the 8th Fleet. With the Starfleet Intelligence debriefing being quite over, Ashelin was gave it some thought and eventually applied to the Washington with hopes and determination to get back on the saddle and do better this time around. Medical History "Cadet Sarrett suffered a deep shoulder wound and minor cuts during the Breen attack on Starfleet Headquarters. Damage to the tissue and nerve centers were healed properly. However, Cadet Sarrett injured the shoulder again during a dance routine but not to the same extent. She has recovered and is clear to be activated for duty." "Lieutenant Junior Grade Sarrett was caught in an avalanche during an away mission, but escaped under fair health. During the same mission, Lieutenant Junior Grade Sarrett became victim to an extraordinarily hostile enemy attack. She received a number of scratches and cuts, though the greatest concern was with the cut that ran nearly parallel with her spine. All injuries have healed accordingly. I now declare her ready to return to active duty." "Lieutenant Junior Grade Sarrett received third degree burns which encompassed 90% of the palms of her hands. They where kept bandaged for approximately twenty-seven hours until proper treatment became available. The wounds have healed very well. She is fit to resume her duties."